Startled, confused and slightly nauseous, I sat up and declared to my groggy husband, “I am starting a new environmental movement.” The words erupted from my mouth. My husband groaned and rolled over while I proceeded to stare into darkness with thoughts roiling through my mind of saving the environment. Earlier that evening, I had watched Donald Trump accept the Republican nomination for the presidency and somehow that televised speech had invaded my sleep. At that time, most of my clan assumed that Hillary had the presidency in the bag, but my reptilian brain must have somehow sensed danger. The concept for Women for Wild Lands congealed into a possibility the following morning. From a fragile state of creativity and sleep deprivation, I proposed the idea to my family. Under my husband’s cautious gaze, my two daughters responded with noncommittal positive statements. I took that as encouragement to move forward and jotted down a few preliminary ideas. The next test would be my friends. Being both grounded and kind, a small group of friends agreed to meet and discuss my latest idea. Café Bernard’s was the designated meeting place, always a good choice. Their first question: “How is your idea different than other environmental organizations? Then: Why don’t we continue to make some donations to the hard working professionals who are protecting the wilderness every day? And: What makes your idea so special? Together we sipped high quality coffee and wrestled with a few scenarios. Words were written down, a preliminary mission statement was created, and by the time we paid the bill the decision had been made to move forward. Our initial focus was simple: to stop bill H.R.3650, a proposed sale of federal public lands to the states for timber harvesting. With the support of my two tolerant daughters, I created a web presence: a new Gmail account: Womenforwildlands@gmail.com, a Facebook page and a basic website. My daughter Anna took charge of the Instagram account: womenforwildlands. We launched our social media presence on August 3, 2016, and then my husband and I left for a week of unplugged hiking in the Sierra Nevada Mountains in California. Upon our return, I eagerly went to the W4WL’s FB page to check the action. It hadn’t gone viral. In truth, the scant activity consisted of posts from my well-meaning friends. No one had found our website, but the Instagram account wasn’t doing too badly (thank you Anna). Somewhat humbled, I realized that our on-line presence didn’t add up to much, and it was time to re-strategize and get back to work. My daughters and I envisioned our citizen’s movement to be free for members and open to all. We wanted to recognize people’s actions rather than their dollar donations. Ultimately our hope was to crowd-source the work by inspiring people to be intrinsically motivated, not only taking action, but also helping with the organizing. We hosted three letter-writing events, recruited new members and bill H.R.3650 was dropped. Was there a correlation to our letter writing activity? I think most definitely, yes. Summer was waning and, as an elementary school teacher, I knew that my life would once again be immersed in the daily education of six to ten year old children. My time as an environmental activist was getting squeezed but the new school year presented opportunities for growing the message and getting new members. Teachers were interested and wanted to take action. A group of about fifteen of us attended the Public Lands forum in Carbondale to learn more about the issues. Fueled with new information, we met at my house to write more letters. Momentum was building, t-shirts were printed and we ordered W4WL stickers. Then Donald Trump was elected. A shocked silence in our community was soon followed by a frenzy of chaotic activity. Directives were coming from all directions on what seemed like every issue. Along with my family, friends and colleagues, I frantically contacted my representatives for a number of concerning issues: the environment (of course), women’s rights, reproductive rights, education, immigration and racism. These concerns swirled among our daily lives. Our community was defibrillating. We desperately signed petitions, wrote letters, sent faxes, sent emails and engaged in animated conversations. Concerns about our public lands swirled among a plethora of other issues. Despair and anger were somewhat appeased by action — any action. 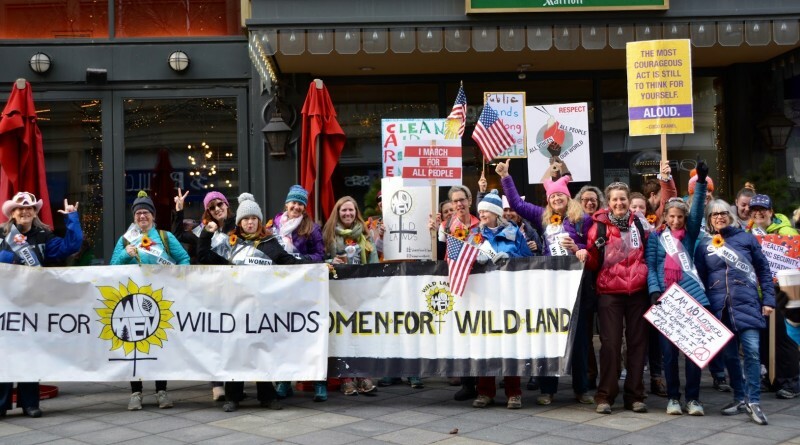 The Women’s March in Denver, January 21, 2017 became a beacon for the Women for Wild Land’s crew. The upcoming event gave us a focus. 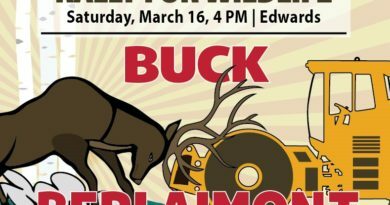 “A group of like-minded outdoor enthusiasts” reserved a block of hotel rooms in downtown Denver and planned for the big day. More t-shirts were ordered, two banners were painted, sashes were made out of reused materials and sunflowers were emblazoned on everything. The list of participants grew and our movement grew: ranchers, artists, teachers, lawyers, writers all with a passion for the environment set aside the weekend to travel to Denver and March. The morning of the Women’s March, we convened in the hotel lobby and were soon swept down the 16th Street Mall. We located the W4WL’s college contingent from Fort Collins and increased our numbers. As an amorphous group of about forty marchers we were soon engulfed by the masses and shuffled into Civic Center Park where we waited for the march to begin. The scheduled start time came and passed as more people converged. We found ourselves immobilized by the sheer numbers of protesters pressing in. The crowd began to move and we shuffled past the Denver Post building. Our group attempted to stay together as each of us gazed around distracted by the signs, the slogans, the outfits and the puppets. A band weaved by and the W4WL’s group became temporarily dislocated. Eventually we reunited and progressed like an accordion, spreading out and bunching up again until we squeezed onto the road where the marching route began. With the two W4WL banners in front of us, we found our stride and began chanting “Public Lands in Public Hands, Public Lands in Public Hands, Public Lands in Public Hands!” Our collective voice was being heard and with it emerged the feeling of empowerment. As the hours passed, the energy of the crowd built. Together we moved through the streets of Denver as individuals, as a group, as a mass. The fluctuating scene around us was filled with a diverse slice of humanity carrying signs ranging from inspirational, to vulgar and to amazingly clever. Eventually we eddied out of the flow, pulling to the side and watched the March pass by us. We chanted, we were interviewed, we saw author Terry Tempest Williams, and she stopped for some photos. Eventually, we reemerged into the stream and were swept towards the imaginary finish line. Being among the last people to arrive back at the park, we gazed at each other, somewhat speechless and giddy with our shared experience. We wandered off into smaller groups to find food, hear speakers and a few of us to take naps. That common experience is the heart and soul of Women for Wild Lands: moving with our message among humanity. Since that time, our citizen’s movement continues to grow and “make some noise.” More people are showing interest and we are connecting with a number of environmental organizations. 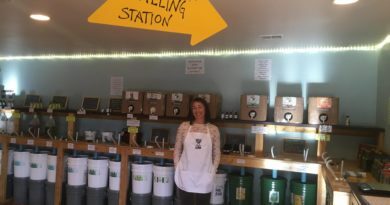 Here in the Roaring Fork Valley we have continued to participate in events including two marches in Carbondale (the Alice March for Science and the Alice March for Climate Change), a hat refurbishing party and an event for the first Colorado Public Lands Day. In Fort Collins, the college students have had crafting parties to raise money and helped to organize and sponsor the “No Man’s Land” film festival on the CSU campus. The movement is growing organically, like crab grass, intertwined and tough. Julie moved to the Roaring Fork Valley over thirty years ago, not only to enjoy the mountain landscapes and recreational opportunities, but also to track down her husband of 28 years, Andre Wille. Together they have raised two daughters and taught many children in the local public schools. Passionate about protecting public lands, Julie and her family, along with friends, have started an environmental movement: Women for Wild Lands. Thank you for dedicating your time to this and creating a positive outlet for supporting our environment. Nice job, Julie- proud to be part of your posse and vision! So proud of our friend Julie, the positive noise she’s creating, and the communities that are responding to our Global challenge. You are amazing and we are so fortunate to have you and your passion for the environment in our school, valley, state, country, world!